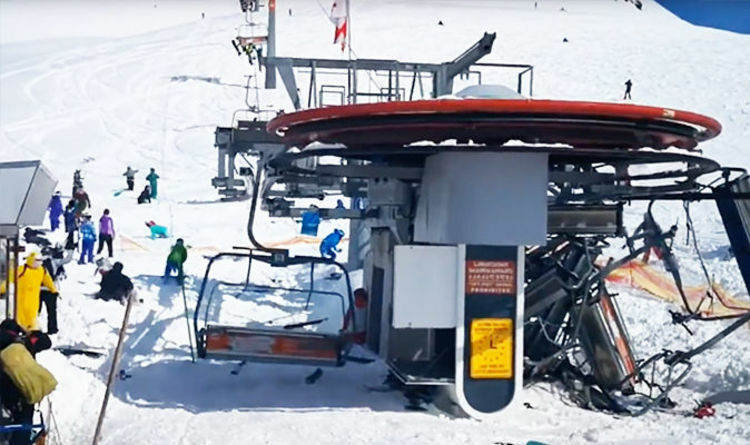 The ski lift in Georgia’s Gudauri resort caused horror among skiers trying to reach the slopes. The resort is located on the south-facing plateau of the Greater Caucasus Mountain Range in Georgia at an elevation of 2,200 meters above sea level. According to local media, the lift had a defect causing it to speed up to double the normal speed. Skiers were being thrown off their chairs as they tried to get off, captured in terrifying video. People could be seen flying off the lift trying to land safely on the snow. No serious injuries have been reported so far, but people were left visible “shaken and shocked”, it has been reported. The Georgian Ministry of Internal Affair confirmed emergency ski patrols were quickly dispatched to the scene and a helicopter helped transport injured parties to hospital. An investigation to establish what happened has been launched under Article 275 of Georgia’s Criminal Code which deals with safety violations and the operation of railway, water, air or cable traffic movement. Georgian health minister David Sergeenko confirmed there were a number of different nationalities involved in the accident, including a pregnant Swedish citizen. He said: “Among the injured are Swedish and Ukrainian citizens. Earlier this year 150 skiers were stranded on a broken chair lift for hours in the Austrian alps. A rescue operation involving helicopters and mountain rescue teams was launched after the ski lift broke in Kreischberg, central Austria. Authorities informed the stuck riders with loudspeakers in several languages that they would be rescued. The stopped chairs were 23ft-33ft above the ground. Every skier was safely rescued.